"I'm turska and this is my favorite blog on the site." Hello, everyone. My name's scrimpeh, and I watch and make TASes. I mainly TAS MSX and Castlevania games, so if you wish to improve one of my movies or work on a game I'm interested in, please do contact me and I'll be glad to assist you with all that I know and WIPs I have made. You can find movies I worked on below. MSX Arsene Lupin the 3rd: Babiron no Ougon Densetsu (JPN) in 04:49.66 by scrimpeh. Arsene Lupin the IIIrd - Babiron no Ougon Densetsu (ルパン三世　バビロンの黄金伝説) is a game based on the animated movie released in 1988 by Toho. 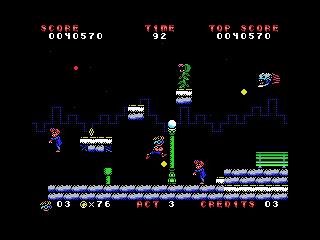 You control Arsene Lupin through 7 stages to help a mysterious space woman get her golden space ship. scrimpeh runs (or rather, jumps) through this fairly short game in 4 minutes and 49.66 seconds. MSX Arsene Lupin the 3rd and the Castle of Cagliostro (JPN) in 07:15.86 by scrimpeh. MSX Invasion of the Zombie Monsters in 04:15.31 by scrimpeh. 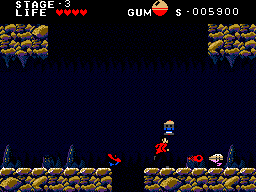 Invasion of the Zombie Monsters is a B-Movie style platformer for MSX. You take control of Ned, a geek trying to save his girlfriend from a giant demon terrorizing the city. 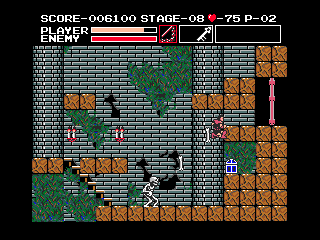 This game was designed to be a throwback to games like Legend of Hero Tonma and Ghouls 'n Ghosts. This is an improvement of 37.88 seconds over the previous run, courtesy of better boss fights and other general optimizations. MSX The Cure in 08:40.85 by scrimpeh. Every one hundred years, the forces of evil mysteriously start to weaken. Though some of these evil creatures band together to counteract this weakness, many of them are still slaughtered by the forces of good. But one day, One, the most evil one, found a way to break this curse and grow only stronger and stronger. Sensing the presence of a cure within the blood of a young woman, he pulled her into the darkness...right before our hero's eyes! Filled with anger, he grabbed his mystical whip and followed One through the night until finding himself at the base of One's fearsome castle. What evil awaits him there? Will he save the girl in time? The goal in each level of this MSX homebrew game is to find the cleverly hidden white key and use it to open the door to the next level. There are also items that can be picked up along the way to help our hero in his quest. In this run, scrimpeh manipulates enemy movement and utilizes damage boosts and invincibility frames to beat the game in under 9 minutes. 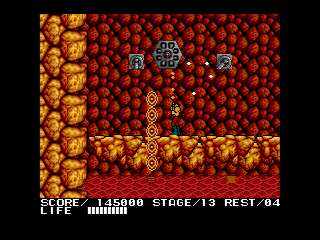 For another MSX game with very similar gameplay, see the run of Vampire Killer done by the same author. MSX Vampire Killer (JPN) in 17:02.65 by scrimpeh. 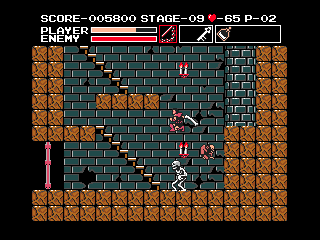 As you can see here, the original Castlevania wasn't only on the NES, but also on the MSX computer. 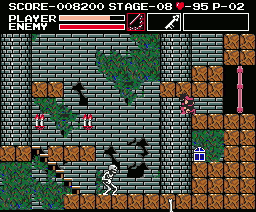 scrimpeh did on the MSX Castlevania what Phil Côté & Morrison did on the NES Castlevania. This version is different in some important ways. 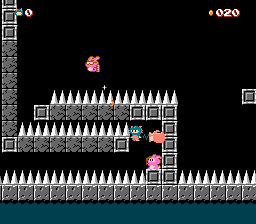 For instance, you must collect a white key in each stage to advance to the next stage. The chain whip is lost after each boss battle. Some subweapons can be bought from sitting bystanders in white or red clothes. This is an improvement of 29.03 over the original run thanks to a few new time-saving tricks. Note: To play the OMR file, you'll need to have the Panasonic FS-A1WSX bios installed and openMSX 0.8.1.dev-12131 (or official 0.8.1). In addition to the normal encode, an experimental WebM encode is available for download. Feedback would be appreciated. MSX Vampire Killer (JPN) in 17:32.07 by scrimpeh. Note: To play the OMR file, you'll need to use the Panasonic FS-A1WSX bios and openMSX 0.8.0.dev-11840. NES Castlevania III: Dracula's Curse (JPN) "Grant path" in 28:35.19 by scrimpeh. This movie takes the path that recruits Grant. It is about 22 seconds faster than the previous version. Improvements come from more optimization, better heart management, and new tricks like manipulating moving platforms and entering walls. There is also a Sypha path movie and an Alucard path movie. NES Frankenstein: The Monster Returns (USA) in 09:39.48 by scrimpeh. 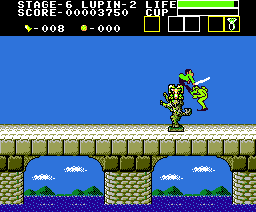 Frankenstein: The Monster Returns is a NES game released by Bandai in 1990. The evil monster Frankenstein has risen from the grave and kidnapped the girl Emily. Our hero is out to save her and defeat the evil monster once and for all. This TAS completes the game as fast as possible using several glitches like boss skips. Check out the author's commentary for more details. NES Super Bat Puncher (Demo) in 09:53.34 by scrimpeh. This is Super Bat Puncher. You take control of Captain Roast of the Bat Excommunication and Eradication Force (or BEEF), who travels to Planet BAT to punch some bats. You get a boxing glove for that which can also be used to boost yourself off of walls, inviting various speed tricks. You also get a little bird companion called Sir Loin who can be controlled by the second player. He's used occasionally in order to manipulate bats or kill out of the way enemies. Further details are outlined in the author's comments. Super Bat Puncher is a homebrew game for the NES by Morphcat, with music composed by Dave Harris. 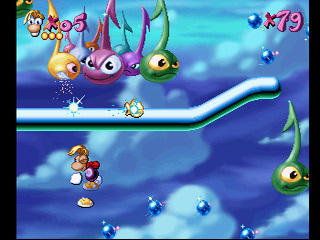 This TAS aims to complete two loops of the demo version of the game, using a bonus item that can only be obtained after the game has been completed once. MSX Knightmare 2: The Maze of Galious (JPN) in 25:04.67 by zggzdydp & scrimpeh. 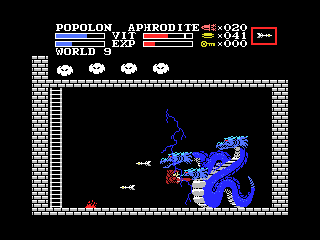 You take control of two Knights, Popolon and Aphrodite, out to rescue their baby Pamperse from the evil high priest Galious. They have their own subtle differences in gameplay, but for the most part, they just act as two separate health bars. The authors, zggzdydp and scrimpeh, run through the game at breakneck pace, taking much more damage than they should be able to. 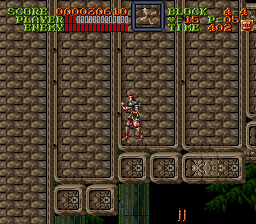 SNES Super Castlevania IV (JPN) in 29:38.08 by arukAdo, Bablo, Cardboard & scrimpeh. 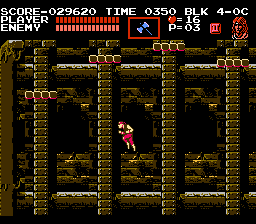 Super Castlevania IV is the first game in the Castlevania series for the SNES. In it, Simon Belmont, equipped with the ability to whip in 8 different directions, sets out to vanquish Dracula yet another time. In this run, the authors, arukAdo, Bablo, Cardboard, and scrimpeh obsolete a seven year old movie by over a minute and a half by a different subweapon choice, new tricks and better optimization. For more details, as always, please see the authors' notes. I've been desiring to make a Rayman run ever since I joined the site. After several WIPs and redos of the Game Boy Advance version, the final submission ultimately came from got4n. 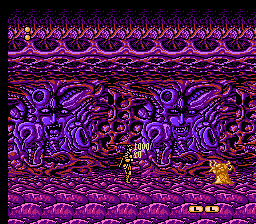 Should at one point the PSX or DOS version become TASable, I will drop everything for a chance to properly work on it. The PSX version will have a significantly different route (Mosquito's Nest before Bongo Hills, no Bongo Hills revisit) from the GBA version due to different cage placement. Here's hoping for PSXhawk to come soon. Since PSX is TASable as of BizHawk 1.11.0, a full-game TAS of Rayman is in progress with got4n and fuerchter. PSX Rayman (USA) by scrimpeh & Got4n in 1:03:18.69 is now complete. A pet project born out of curiosity to see whether it is possible to complete the game within those conditions. A run has been submitted, but rejected due to poor entertainment value. It is also possible to save several seconds with better optimization and manipulation. Several improvements to the current publication exist, but have yet to be implemented. I made a testrun of this game in 11:34. Refer to this forum post for details. Later a full run of the game saving over two minutes was submitted and accepted to the site. The purpose of this section is to list known improvements to published movies of mine for the benefit of others looking to update them. Also for myself, so I don't eventually forget about them. Destroy the weapon box in the second screen of Stage 1 to reduce lag. Same procedure in other rooms. Take one or more additional damage boosts in the falling stages. There's enough health overall. Get a knife at the beginning of BLK-01 - doesn't save any time, but adds more variety. The published run loses 4 frames on the BLK-03 boss due to bad optimization, it may also lose time on other bosses in similar fashion. Why did I whip the Medusa Head in Stage 6 again? This page appears to be the personal page of scrimpeh.